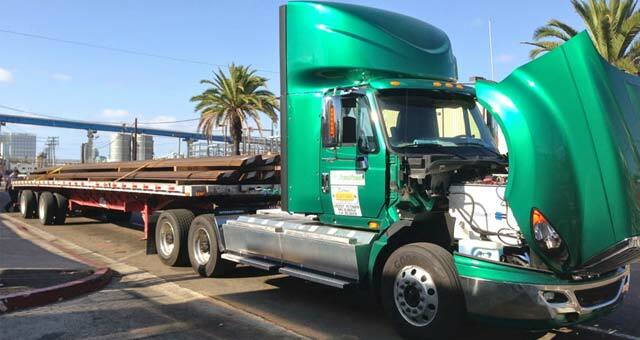 Update: Mercedes Benz city distribution truck. Trucking around the world is a major pollutor. In the developed countries the engines and fuels may be optimized, but in the rest of the world they are not, and soot and NOx and fine dust is spread into our streets and fields. It is a part of our real economic system that would be easy to neutralize in terms of climate impact : Just use Ammonia, NH3 instead of diesel, and the CO2 and VOC (Volatile Organic Compounds) and of course the pollution of the supplying fossil industry would be eradicated. NH3 however seems to be one of the fuels that will never happen. The first thing we should ask, before we rejoice in innovation is why we are shipping goods over such incredible distances. Is it because of economic divide and conquer? Because this gives banks control over our lives? Maybe first start to do locally what we can..
Walmart optimizes its fuel use and now experiments with a hybrid truck, a gas turbine/electric system. Soon it will find it can eliminate the driver and create drone trucks. The hybrid systems seem efficient but can not match electric. Electric trucks have been driving around ports for ages, but over short distances and at slow speeds. Still some lessons may be learned from their use. 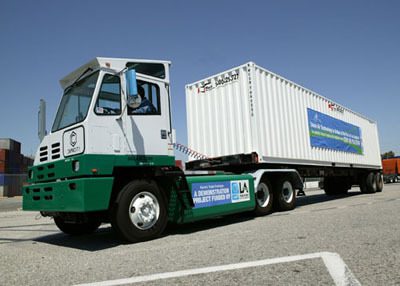 Truck building companies however have to jump into the opportunity to build electric trucks or be left behind, so big is the efficiency advantage. Its not impossible as can be seen in the image below..
Swiss based E-force AG also has an electric truck. The conversion of a normal to electric truck is not that complicated so it is likely that a lot of other manufacturers will pop up. It seems this company has been create soley for producing electric trucks. Rail transport has been more efficient than road transport, simply because the rail system creates less friction and losses. It does require transfer of f.i. containers from the truck bed to the rail carriage, and this is an energy and time consuming process. The trolley system is like electric road rail, and is more than 100 years old. Maybe if it is adopted more widely some will suggest to adopt the rail bed for truck wheels, or give trucks rail wheels to hop on rails when they can. This would be even easier if the logistics along rail tracks is fully automated, so no drivers in the trucks. 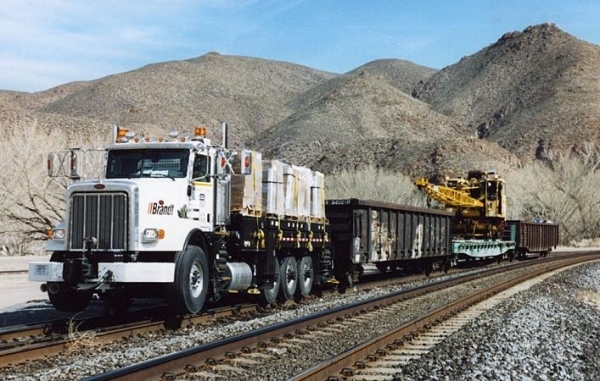 This is a railroad diesel truck towing wagons..Why not electric? Ammonia was considered for hydrogen distribution. It was tested (as we reported) against other fuels and find to be safer due to it’s higher combustion temperature and lower toxicity. It has a distribution system in place (for agriculture) and can be made using renewable energy. Either burned directly or first split into N2 and H2 and used in a PEM cell to generate electricity. Ammonia production from electricity, air and water..
Ammonia used in a pick up truck. It is really the fastest way to transition to CO2 free trucking. The man in the video explains how he created his CO2 free truck 20 years ago, but was stopped by the oil lobby. The oil industry has been fighting for it’s position with extreme force (as the dominant player) for decades, and the damage to our future is dramatic. Time to give it a shot, go for fast track inprovements in emissions, at least in the short term. Once CO2 is in our atmosphere it is like ink in a swimming pool, very hard to wash out again..
And of course new trucks can be self driving..
Self driving trucks for freight are a logical extension of the already partially unmanned logistics systems in ports and distribution centers. Several companies are working on them. Unlike with cars though trucks will have to be fully automomous, or remote controlled. Drone trucks so to say..